The content on Wikipedia consists of several different types of page. Today, we’re going to talk about what these various pages are, and the functions of each in turn. Wikipedia’s front page. This gets about 5.5 million daily views during the week, and around 4.5 million on the weekend. This is the top section of Wikipedia’s Main Page. It contains a different article every day, and is intended to provide users with a sample of the best that the site has to offer. 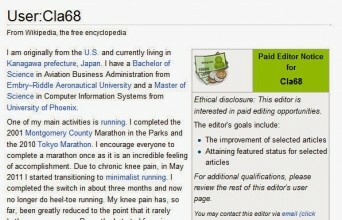 This is the main bulk of the content of Wikipedia, and the pages that fall into this category include articles, templates, user essays, onsite projects, and guidelines. Every project page is accompanied by a Talk and a History page detailing the various revisions and the rationale behind them. If you would like to visit a single page to find out when certain articles that you have an interest in are updated, then you should start adding pages to your “Watchlist”. This can be achieved by clicking the star at the top of any Wikipedia article, which makes it appear on your watchlist when any changes are made. However, this page only shows the most recent change to that article, so if there has been more than one edit, you have to visit the history page for that article to see everything that has been changed. This is where the various contributors to and editors of an article discuss amendments and revisions. They usually feature indented replies from the various participants in the creation and revision process behind a Wikipedia entry posted at the base of each discussion section, with signatures appended so that you know who said what, and when they said it. “User talk” is a term used to refer to discussion pages that are associated with user accounts. Every time an article, discussion, or project page is amended, each change is logged forever on the History page associated with that article. These can be viewed by clicking on the “View history” tab at the top of a page, which brings up a listing of changes that have been made to the page in reverse chronological order. “Cur” (short for “Current”) demonstrates the difference between that version and the article currently being displayed, and “Prev” (“Previous”) displays the difference between that version and the previous one. In addition, the time-and-date link will display the version of the article that corresponds to that particular time and date. This is your “home” page once you have created an account, and you can populate it in a variety of ways, such as listing pages you have edited or intend to edit, and writing about yourself and your interests. It is common for editors to include “Userboxes” to bring together key information about yourself in much the same way as you might with an “Infobox” on an article page. But while this page is personal, you are still not allowed to post any copyrighted images or written material, and you are also not allowed to use the page as a personal blog. Although you don’t really need to use this page in most cases, it does allow you to change various aspects of your Wikipedia experience to customise it to your preferences. For example, you can create a custom signature for yourself, change the time zone from the default setting of Greenwich Mean Time (GMT), and if you want your watchlist to show all changes, as opposed to just the most recent, then you can also select this option here too. 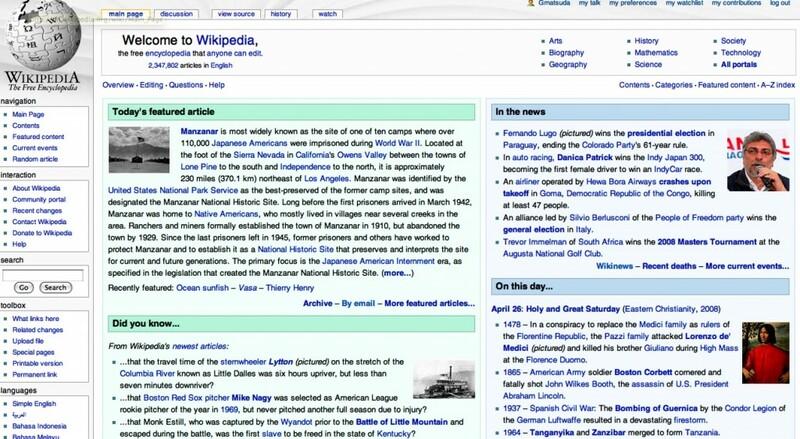 Users can create sub-pages that link off their main user page, and these can be used for a variety of purposes, such as hosting articles that aren’t quite ready to be published as articles on Wikipedia proper, or for creating a scratch pad or “sandbox” for new ideas. Like the History pages attached to Project pages, User accounts are appended with Contributions or “Contribs” pages that show all the edits made by that account. This is similar in format to the History page, but instead of “cur” or “prev” there is a link type called “diff” that is used to display the difference between versions of the page that is related to that particular edit, and there is also a “hist” link type that displays the history of the page edited by the user in question.